January 8 – February 8 – James Sterling Pitt at Gallery Paule Anglim: San Francisco based artist James Sterling Pitt’s visualizations of memory will be on display at Gallery Paule Anglim. Pitt combines object based ‘journal’ drawings with abstract sculpture to juxtapose the recognizable with the conceptual. An opening reception will be held at the gallery on January 9th from 5:30 – 7:30. Gallery Paule Anglim, 14 Geary St, San Francisco. January 15– 19 – FOG Design + Art at Fort Mason Festival Pavilion: San Francisco hosts the best of international art and design at the inaugural FOG Design + Art fair. Featuring more than 40 designers and dealers from the Bay Area and across the country, including local galleries and artists, lectures and pop up exhibitions, the fair is a one stop shop. See the FOG website for tickets, locations and a schedule of events. 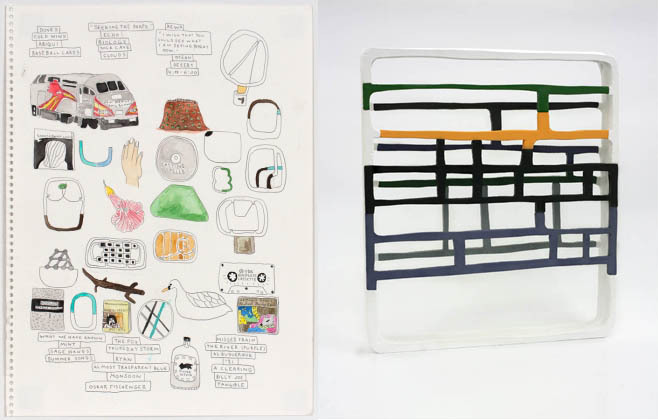 January 27- SFMOMA Artist Talk – Chris Johanson, Mike Mills, Kateřina Šedá at SF JAZZ Center 7:00 PM: Three of the featured artist from SFMOMA’s Project Los Altos will discuss their local projects and their greater bodies of work. Featuring both indoor and outdoor pieces, commissioned works included in Project Los Altos can be seen throughout the downtown area and online here. Tickets are $10 general; $7 SFMOMA members, students, and seniors, available at sfjazz.org. SF Jazz Canter, 201 Franklin Street, San Francico. Chris Johanson, known for his deceptively simple paintings and works characterized by humor and vibrant color, created five site-specific sculptures for outdoor locations throughout downtown Los Altos. Mike Mills is the director of Thumbsucker and Beginners, and has created album covers for popular bands such as the Beastie Boys, Beck, and Sonic Youth. His new work for Project Los Altos, A Mind Forever Voyaging Through Strange Seas of Thought Alone: Silicon Valley Project, looks at the city’s past, present, and future. Kateřina Šedá‘s commission, Everything Is Perfect, invited residents of Los Altos to submit their talents for a compilation of the ordinary and unique. Johanson, Mills, and Šedá will speak about their intimate and extensive exploration of social life in Los Altos, as well as many other projects. 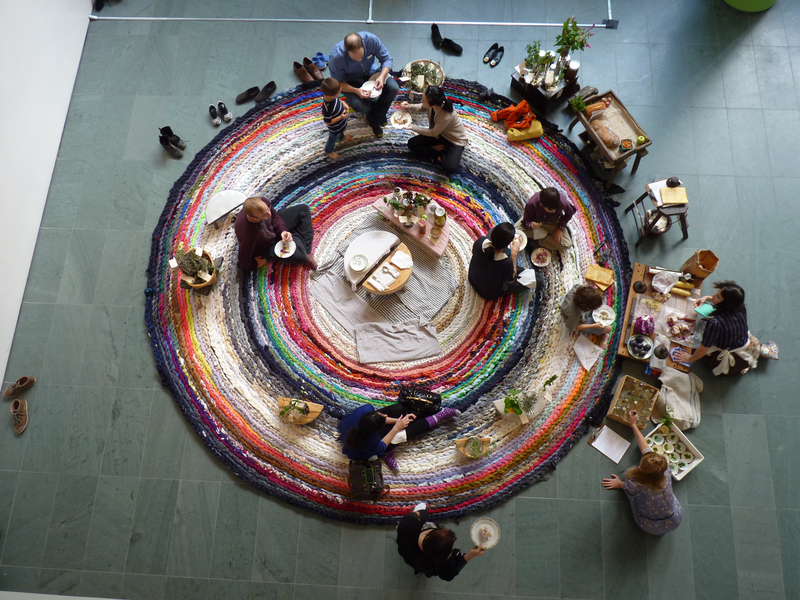 January 29 – May 25 – The Possible at the Berkeley Art Museum (BAM): The Possible aims to create an experimental exhibition combining many spheres of creative space from gallery and studio to classroom and library. Featuring work by over 100 artists who collaborate as artists and with viewers, the exhibition will both seen and created simultaneously. Tickets to BAM are $10 for adults and $7 for Non-UC Berkeley students, senior citizens (65 & over), disabled persons, and young adults (13-17). View visitor information and buy tickets here. (installation view from the Museum of Modern Art). Photo: Jack Ramunni, Mildred’s Lane via BAM.